England manager Roy Hodgson should build his team around Tottenham striker Harry Kane, according to ex-Spurs midfielder Danny Murphy. 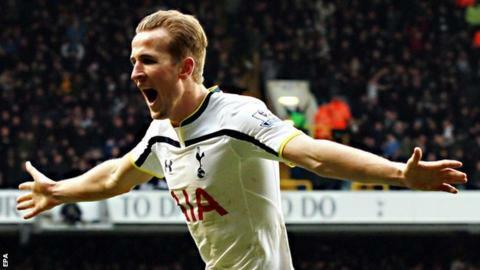 Kane scored both goals as Spurs came from behind to secure a 2-1 win over Arsenal at White Hart Lane. Gunners boss Arsene Wenger said England should select Kane, 21, after scoring 22 goals in 34 matches this season. And former England international Murphy added: "Not just selected, but build the team around him." Murphy, speaking on Match of the Day, added: "He's so young, but he's so powerful. "I'm struggling to see a weakness in the lad's game." Wenger said: "When you have scored the number of goals he has scored, if you don't put him in there somebody else will give him a passport." Hodgson was in attendance at White Hart Lane as he continues his preparations for England's next European Championship qualifying fixture against Lithuania on 27 March, before a friendly against Italy four days later. Kane, who is also eligible to play for the Republic of Ireland through his father, has represented England at every level from Under-17 to Under-21, and has previously stated his desire to break into the senior England squad. Hodgson has used Danny Welbeck and Wayne Rooney in attack for England's previous four fixtures, but can now call on Liverpool's Daniel Sturridge, who has returned from injury, and the in-form Danny Ings at Burnley and QPR striker Charlie Austin. Both of Kane's goals on Saturday came in the second half as his close-range finish following a corner and well-taken header turned the game around after Mesut Ozil's close-range finish opened the scoring for Arsenal in the first half. "Harry showed today that he is a great player, with a great performance, but my idea is that he can improve still and we need to push him to develop his potential because his potential is massive, but it was a fantastic performance today," said Tottenham boss Mauricio Pochettino. Kane told BBC Sport: "It's my first north London derby and it was incredible. I watched so many as a kid and the feeling now is one I can't describe and won't forget. I'm happy for the team and the club. It is a special day. "I am working on all aspects of my game and when I get in those areas I am confident. I am enjoying my football at the moment and playing with a smile on my face. "It [the next England game] is not until March and there is a lot of football to play before then. I have just got to keep doing what I am doing and do my best for the team, and we will see what happens."